In common with much of France, Maison Celle does not have the luxury of a household rubbish collection. We have communal bins in the centre of the village, to which we walk our Poubelles in black bags and also our recycling bags. Glass is not permitted in the clear recycling bags and must be taken to a glass recycling point, the closest of which is in the centre of Saint-Rémy. A wide variety of items not permitted in the black bags must be taken to the Dechetterie in Lathus, which is also the collection point for black waste bags and clear recycling bags (which are free to all residents). Organic waste goes to a composting Dechetterie point. We have not yet discovered where ours is, so we have a domestic compost heap instead. Digester cones don’t seem to be in evidence in France. We had our first trip to the Dechetterie yesterday, calling first at Saint-Rémy with some bottles. We could have taken them to Lathus but they were perched on the back seat (Nell was in the boot) and waiting for a disaster to happen, we were better rid of them as soon as possible. We took our Attestation (proof of residency status) and showed it to the attendant, who duly handed us two rolls of each type of rubbish bag. Rather, Mr L attended to that. I sat in the car and read the signage regarding what is and is not permitted at the Dechetterie. Quite fascinating. One may get rid of ones Radiographic film there but not one’s dead donkey, for instance. It is a smashing little amenity site and quite the best arrangement that I have ever seen, involving a ramp arrangement for driving cars up and around the various waste containers. It is, like the rest of Lathus, very clean and tidy. It is also very well used and was extremely busy on Saturday morning, with cars constantly coming and going. France really does appear to have its act together on proper waste disposal and recycling. It is worth noting that arrangements vary by Department and are not common nationally, as we have discovered on our travels. I tend to prefer the Yellow Bag arrangements where households collect cans and glass for central point collections. Going to the glass bins has never been my favourite task (noise, broken glass underfoot, wasps…) but here in La Vienne, we seem to be stuck with it. With our Civic responsibilities sorted we stopped off at the SPAR for a couple of items and then parked up at the car park/Motorhome Aire by the park on the D10, a place that is very familiar to us. We thought that as we were in Lathus we might as well have our daily walk round one of the local Boucles. We elected to do number 1. I think I may need to start a ticky list. I have the bit between my teeth now and wish to complete the Du Roc à St Rô network of boucles. So far we have 1, 4 and 9 under our belts. As Mr L says, we have done the Squares, let’s do the Primes next: 3, 5 and 7, here we come! We live at the top end of the network, with no 9 running around Maison Celle. No 1 starts in the centre of Lathus, where the network intersects with another set of paths, L’Aiguail de la Gartempe which runs from Montmorillon down to Lathus. These paths will require a second ticky list… and the set around Adriers a third ticky list, plus, as we found out yesterday, a fourth set intersects with the St Rô paths, La Bujade aux Fées appears to be based on Bourg-Archambault and has at least 12 paths. I am currently unable to find any hard information about that network but will be pursuing it. 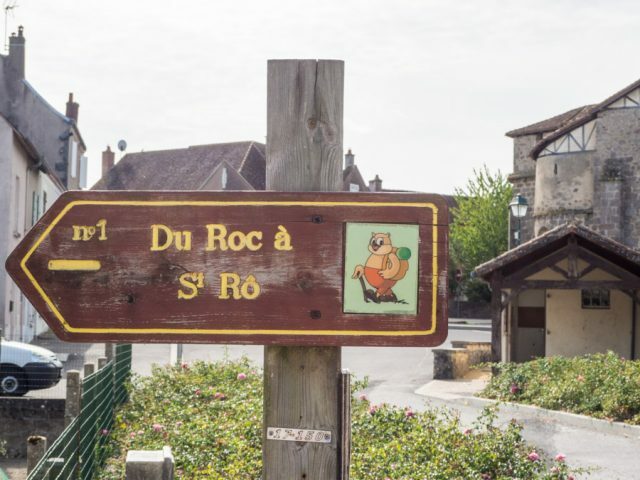 Boucle no 1 of the Du Roc à St Rô is listed as 10 kilometres and it loops around the North West side of Lathus. We have walked sections previously but not been able to tackle the whole route due to ground conditions at the time. Lathus is a quiet little town, very neat and well taken care of. This is the main street, we have just turned the corner of the D10 by the Church after leaving the car park and will turn right after the trees. After crossing the railway line we walk past a few residential properties and then onto a chemin, where Nell is more than happy to be finally freed of her leash. Allons-y! After leaving the margins of Lathus the walk is mainly on unsurfaced chemins and quiet tarmac roads but there are also short sections involving traffic, though nothing too grim or dangerous. Happily it is is largely level ground with a handful of gentle inclines, nothing more arduous than that. The first sections are quite easy going and we made a good pace – far better than Tuesday’s over-heated trudging. We soon reached the limit of previous exploration and were onto pastures new. After a while we turned onto a lesser used section that was initially more of a path than a chemin and led to a ford. The ford was dry after the heat of this summer. …and Nell found a frog pond. Nell was so excited by this discovery that she entirely forgot that she doesn’t care for water and actually waded in. It was actually only one of many ponds and small lakes that we passed during the day. Nell’s passion for frogs was well satisfied on this particular walk. Another pond, just about at the halfway mark, where we stopped for a drink and a bite to eat. I was taken by the combination of bulrushes and convolvulus. It didn’t come up well on camera. I’ve pushed it about a bit but still find the shot disappointing, it looked better in real life. Passing through a small hamlet, little more than a single farmyard really, where most of the properties were ruinous or deserted, we were serenaded by invisible geese as we passed by onto another rough and narrow path, where our pace was slowed once again. … a long way from any road. Shortly after, we reached a signpost at a junction, by yet another lake, that Mr L declared to be all wrong; it was sending us left when he thought that we should be going right. He consulted the map and wandered around under the trees trying to find a GPS signal. We discussed the possibility that the path had been re-routed since the map was drawn up and thought perhaps we should follow the sign for a while to see what happened. We did just that but when we approached the next junction, there was no signage for our route at all. We turned around and went back to take the right hand fork. In a very short distance, at the end of the lake after we reached a signpost that at least had No 1 on it, even if it was going the wrong way but it was also a point that I recognised. I had been here back in March with Nell whilst Mr L was in Yorkshire. We had walked this far to find the route barrée. I was able to confirm position and the way home. Nell also seemed to recognise the way and when we approached the railway line brought herself to heel. She did the same again as we approached the road. She seemed to remember what was required of her on previous walks (when we had come at it from the other direction). Certainly, as we got ever closer to base, she was more and more confident about selecting her route at junctions. She remembered the way home. She was overjoyed to be back at the park, where we had spent much time when staying on the aire on previous visits. With the mis-signage “spur” to our walk the 10k actually came in at a nudge under 12k. I know this because my Fitbit app managed to record this hike properly, unlike on Tuesday when it failed on Boucle no 4. So, we have hundreds of kilometres of local walks at our disposal. I think that we shall have much fun in “collecting” all of the boucles and completing our “sets”. I should quite like to document them all properly and perhaps produce a small publication. Would you care to come out with us on our next adventure?